But this Stovetop Mac and Cheese meal got two thumbs up from my daughter. 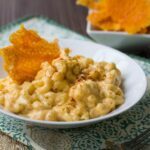 In addition to the cheese crisps, this recipe has one of my favorite ingredients- mascarpone cheese. 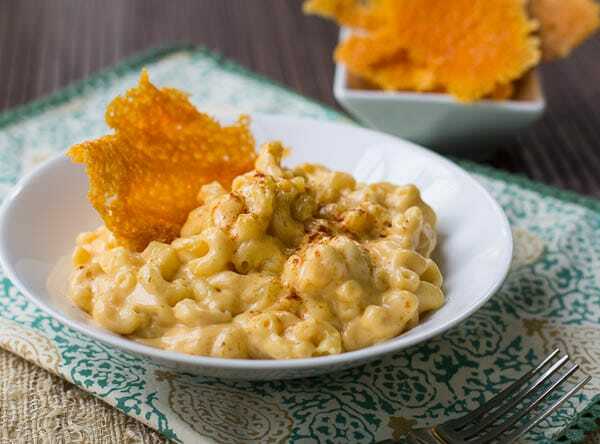 It makes the sauce extra rich, creamy, and velvety with none of the grittiness that’s sometimes present in mac and cheese. The sauce is thick enough to perfectly coat the macaroni. Set aside 1 cup of extra-sharp cheddar. Heat a large nonstick skillet over medium heat. Using 1 cup of the cheddar cheese, drop cheese in pan to form 8 mounds of cheese. (You may have to do them in 2 batches.) As you drop the cheese spread it out in the shape of a 4-inch pancake. Cook until lacey and golden and then flip over carefully using a flexible spatula. You may mess up the shape of the first few while you are getting the hang of it, but they will still taste good. Cook for about 1 minute on the second side and place on a paper-towel lined plate. Bring a large pot of salted water to a boil. Add macaroni and cook until al dente. Drain. In a very large saucepan or Dutch oven, melt the butter and whisk in the flour. Cook over medium heat for about 2 minutes, until bubbling and the raw taste of the flour has had a chance to cook out. Add the paprika and white pepper. Gradually add the milk, whisking rapidly to keep the mixture smooth. Cook for 5 minutes, whisking constantly, until thick and creamy. Stir in the remaining 1 cup of cheddar and the fontina and cook over low heat until the cheese melts. Remove from heat and stir in mascarpone cheese and add salt to taste. Add pasta to sauce and cook over low heat, stirring continuously, until hot. Serve with cheese crisps. 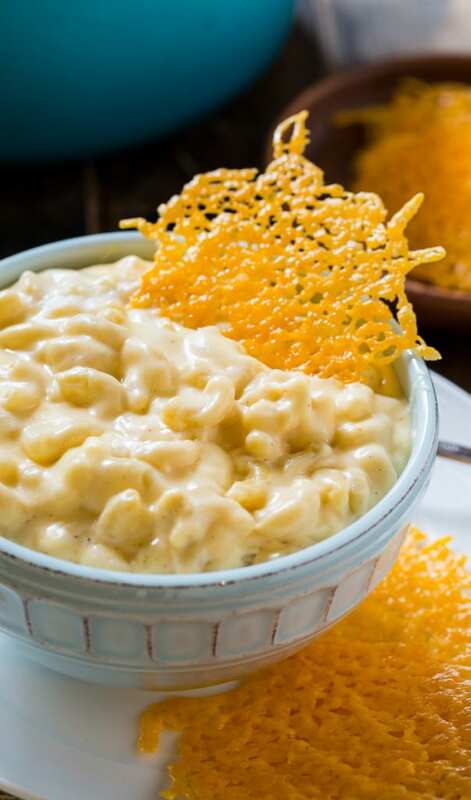 This entry was posted in Main Dishes, Side Dishes and tagged mac and cheese, mascarpone, pasta. Bookmark the permalink. 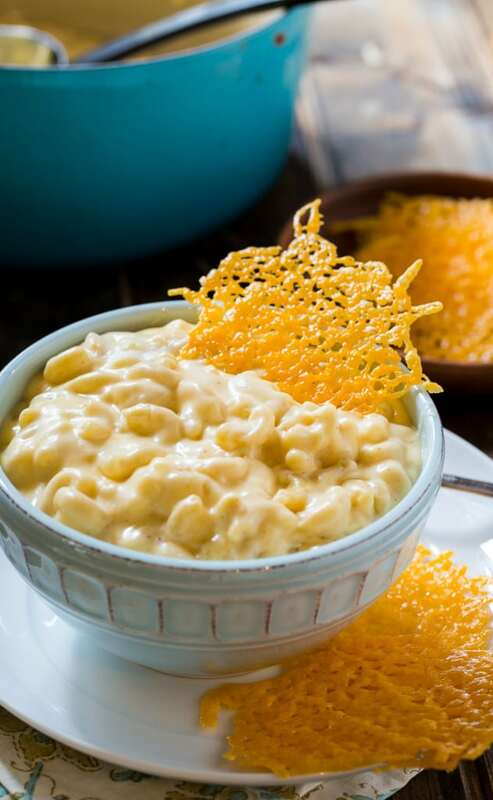 That is one outstanding looking Mac & Cheese. I love that you used Mascarpone…never thought of that before. And the cheese crisps is a pretty cool touch, especially when entertaining. 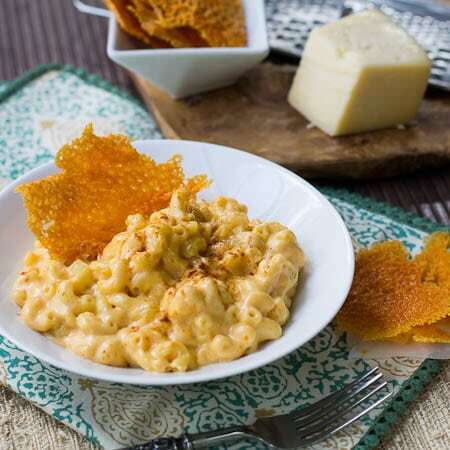 Thanks for sharing the recipe, going to try the Mascarpone out next time I make Mac & Cheese. Love this idea! 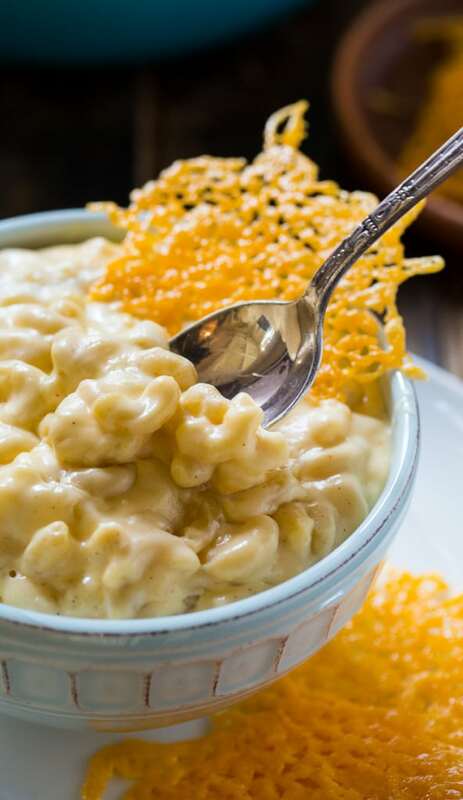 Mac and cheese is my favorite and I’ll have to try this variation soon. Thanks Becky. I think you’ll like it! Cheese with more cheese?! I’m sold. Can’t have too much cheese can you. This is missing the amount of macaroni you are supposed to use. Thanks Roseanna! I always seem to miss something no matter how many times I look it over. It’s for the crisps not the man n cheese. This looks delicious! Mac and cheese is my all time favorite comfort food. It is the perfect comfort food isn’t it! I love mac & cheese! How do you make the cheese crisp? or are they store bought?